Rekindling ridden by Corey Brown and trained by Joseph O’Brien wins the Emirates Melbourne Cup, followed home by Aidan O'Brien-trained Johannes Vermeer in second and the Willie Mullins-trained Max Dynamite in third. 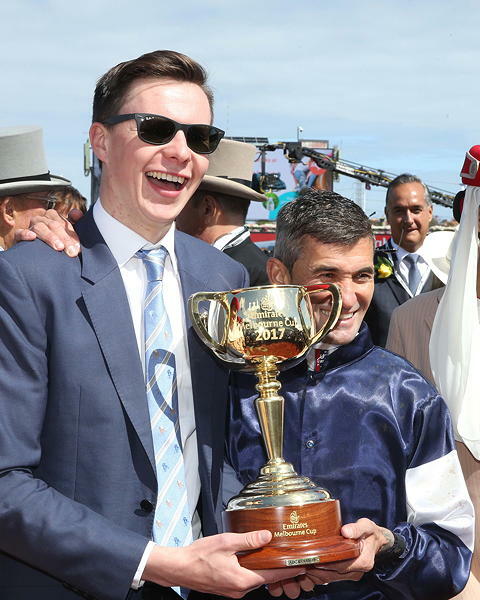 History was made at Flemington Park, Australia when Joseph O’Brien became the youngest-ever trainer to win the Emirates Melbourne Cup as Rekindling led home an Irish 1-2-3 under Corey Brown. Rekindling is the third Irish-trained winner of the world's richest handicap, bridging a 15-year gap, when the Dermot Weld-trained pair Media Puzzle claimed victory in 2002, and Vintage Crop in 1993. Six Irish-trained horses went to post and dominated the first three places as Johannes Vermeer came in second for Aidan O’Brien, with Max Dynamite, narrowly defeated in the race in 2015, back in third for Willie Mullins. Rekindling was settled in behind through the early stages as Boom Time, Gallante and Cismontane were among the first to show, with the latter eventually setting the pace. Hughie Morrison's Marmelo also raced prominently in fourth while Mullins' Thomas Hobson and the winner's stablemate US Army Ranger were towards the back of the field. As the pace turned up a notch approaching the home turn, Marmelo threw down his challenge but Johannes Vermeer appeared to be travelling well on his heels and he kicked on with around a furlong and a half to run. Max Dynamite tried to go with him on the inside but Corey Brown was really just getting to work on Rekindling and the colt found an extra gear on the outside to get up on the line. O'Brien said: "I can't quite believe it yet. I'm so delighted for Lloyd and Nick (Williams, owners). They suggested to bring him down and that he would have a good chance in the race. "His prep went really well. Corey gave him an unbelievable ride and I'm just so delighted for everyone - all the lads at home and the lads that have been down here have done an unbelievable job. "It hasn't really sunk in yet to be honest. "He had a very light weight and Corey gave him a great ride. It's not often in a big race like that the whole run goes so well. I'm over the moon. "I spoke to my dad and he's delighted. "I'm so delighted for Lloyd and Nick, they have been big supporters of mine and sent me some lovely horses. There's some nice two-year-olds at home and I'm so delighted to have won this race for them." O'Brien added: "I'm going to enjoy today and hopefully we'll have a horse good enough to come back." Lloyd Williams, who was winning the race for the sixth time, told Channel 7: "I'm so proud of this young man - he's a star. "I've been telling people the father needs to watch out!" Brown was riding his second Melbourne Cup winner after Shocking in 2009 and said :"I'm speechless. It's a dream to even ride in the race, but to come out and win it again, I'm lost for words. "I always thought I was going to get Johannes Vermeer, especially with the light weight. "I had a great run in transit. I was a bit slow away but after speaking to Joseph, I didn't want to rev him up and get him too keen. He had a perfect run and deserved to win."